Lot # 43: 1962 Topps Baseball Bucks Mickey Mantle (PSA NM-MT 8) Highest Graded Copy! 1962 Topps Baseball Bucks Mickey Mantle (PSA NM-MT 8) Highest Graded Copy! One of the more obscure Mickey Mantle issues is his 1962 Topps Baseball Bucks subject, presented here in a spectacular PSA NM/MT 8 holder. One of only eight at this stratospheric plateau, it shares the proud distinction of being the finest of its kind! In 1962 Topps issued an extremely eclectic 96-subject set titled "Baseball Bucks" with black & white baseball player portrait images and related text affixed to a green hued facsimile currency surface that measure 1-3/4" x 4-1/8". Since these Baseball Bucks were folded in half in their own 1 cent packages, professional grading services apply their technical assessments without regard to the standard vertical folds (unless, of course, these folds portray obtrusive abuse). Of the 96 total subjects, 62 appear on "One Dollar" notes (common players); 24 appear on "Five Dollar" Notes (star quality players); with the ten superstars printed on "Ten Dollar" notes. 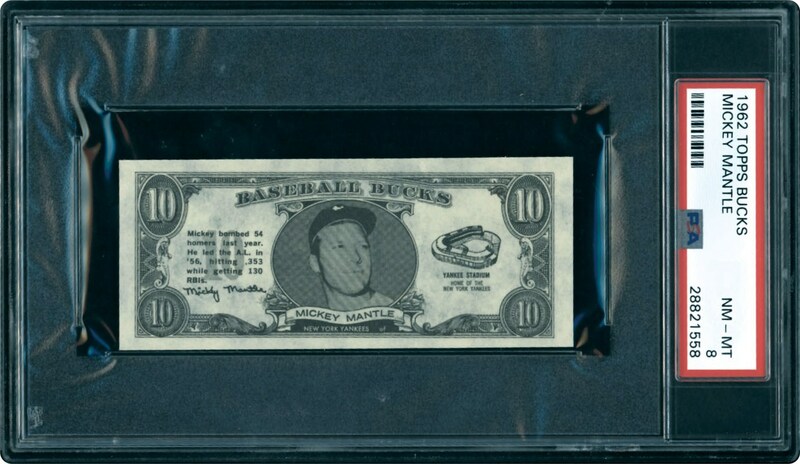 As is the case with virtually every post-war issue, the set's most valuable and coveted player is Mickey Charles Mantle who is obviously depicted on a $10 note. Even more impressive is the fact that this "best of the rest" offering reflects nearly impossible "fine centering", since most of the existing examples exhibit skewed images. The Mick's hallowed portrait image includes his name on a banner directly beneath the illustration, with a line drawing of Yankee Stadium directly to the right. 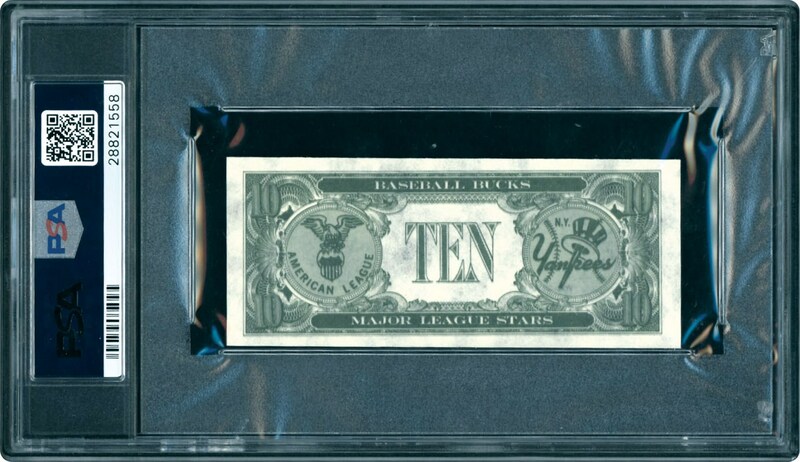 The verso includes a significantly large "TEN" text directly in the middle, with the American League and Yankee insignias situated directly to the left and right, respectively. One of the best-preserved specimens in the hobby for the most desirable subject, its rightfully earned pinnacle grade is ironically synonymous to Mantle's unparalleled power that enabled him to outdistance the furthest confines of any ballpark!